Status: Deceased; Active 1967-1968. Born: 1932-04-22. Died: 2013-07-02. Birth Place: Cardiff, Wales. PERSONAL DATA: Born April 22, 1933, in Cardiff, Wales, United Kingdom. Married to the former Valerie Mya Davies-Jones of Cardiff, Wales. They have three children. His hobbies include scuba diving, swimming, fishing with spear and rod, and boating. ORGANIZATIONS: Member of the Radiation Research Society, the American Institute of Aeronautics and Astronautics, the International Oceanographic Foundation, the American Association for the Advancement of Science, The Royal Institute for Chemistry, and Sigma Xi (Research Honorary). EXPERIENCE: Llewellyn served as a post-doctoral fellow at the National Research Council in Ottawa, Canada, following the award of his doctorate in chemistry. In 1960 he went to Florida State University as a research associate in the Chemistry Department and was subsequently appointed Assistant Professor. In 1964 he was given a joint appointment as Associate Professor in the School of Engineering Science and in the Department of Chemistry. NASA EXPERIENCE: Dr. Llewellyn was selected as a scientist-astronaut by NASA in August 1967. Having completed initial academic training, he and the other members of this sixth group of astronauts are undergoing pilot training in preparation for future manned space flights. 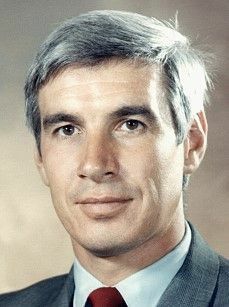 Dr. Llewellyn withdrew from the program in September 1968 for personal reasons and presently is the Director of Engineering Computing, College of Engineering, University of South Florida. Family: Astronaut. Country: UK, USA. Agency: NASA. Bibliography: 12, 5707. 1932 April 22 - . Birth of Dr John Anthony 'Tony' Llewellyn - . Nation: UK, USA. Related Persons: Llewellyn. British-American pilot astronaut, 1967-1968..
2013 July 2 - . Death of John Anthony Llewellyn. - . Related Persons: Llewellyn. British-American pilot astronaut, 1967-1968..